Facebook has become a force to be reckoned with in the Middle East and North Africa and the platform can now claim 15 million users as of May 2010. 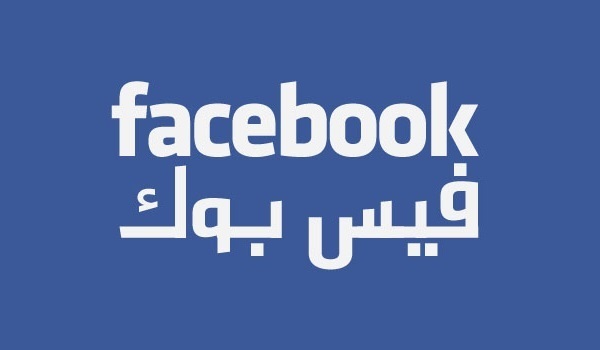 Whilst Facebook saw strong early growth in 2008/2009 from English and French speaking users across the region, Facebook’s decision to add an Arabic interface in March 2009 has opened up access to a whole new demographic of Internet users and added 3.5 million Arabic users over the past year. Egypt and Saudi Arabia’s Facebook communities have seen the strongest growth among Arabic users during the past year with each adding 1.1 million Arabic language interface users. 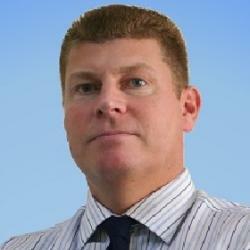 We soon expect the number of Arabic language Facebook users in Saudi to surpass the number of English users. However, with the strong expectation that the weight of numbers will move from English language users to Arabic language users in a number of key MENA Facebook markets, today’s reality is that just 23% of users across the region use Facebook’s Arabic interface. So, those seeking to make the most of the Facebook platform are advised to keep up-to-date with its changing demographics. — There are now 15 million Facebook users in the Middle East & North Africa (this figure excludes Iran, Israel, Pakistan and Turkey). 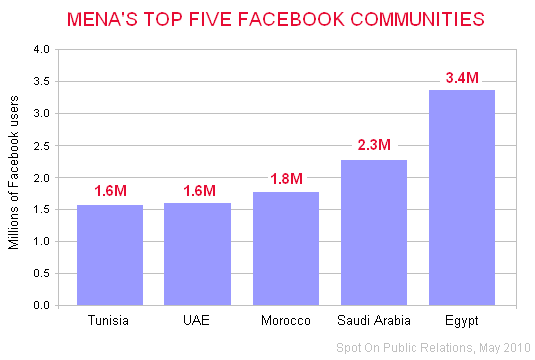 — MENA’s top five Facebook country markets, Egypt, Morocco, Tunisia, Saudi Arabia and the United Arab Emirates, account for 70% of all users in the region. — 50% of MENA Facebook users have selected their primary language for using Facebook as English, with 25% preferring French and just 23% Arabic. — Only 37% of Facebook users in MENA are female (compared with 56% in the USA and 52% in the UK). Only Bahrain and Lebanon Facebook communities approach gender equality with female users accounting for about 44% of total users. — The GCC has five million Facebook users, which Saudi Arabia and the UAE representing 45% and 31% of that total respectively. — North Africa has 7.7 million Facebook users, with Egypt accounting for 3.4 million users (or 44% of all North Africa users). Egypt has the largest Facebook community in MENA. — Francophone countries Algeria, Morocco and Tunisia together account for 3.7 million French speaking Facebook users, equivalent to nearly 25% of all MENA users. 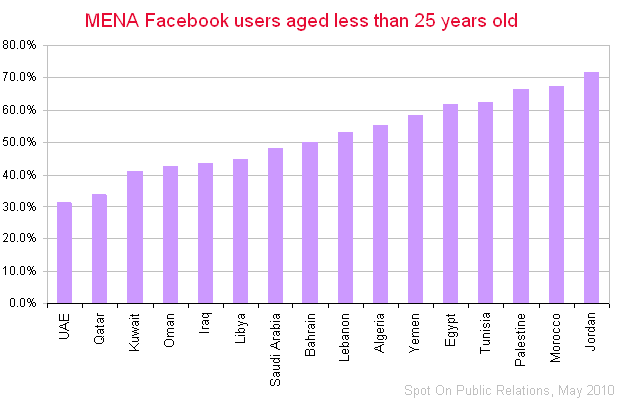 — Algeria, Egypt, Jordan, Lebanon, Morocco, Palestine, Tunisia and Yemen all have Facebook communities with more than 50% of users below the age of 25 years old. — The UAE has the oldest Facebook community in MENA with 41% of users being over 30 years old, 28% being 25-29 years old and 31% being under 25 years old. Note: update on Egypt demographics now available. Click on the link below. 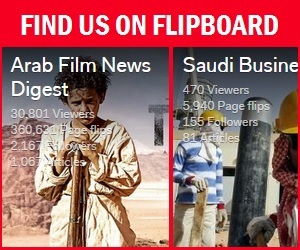 Middle East & North Africa Facebook Demographics by Spot On Public Relations is licensed under a Creative Commons Attribution-No Derivative Works 3.0 United States License.